It started with a craving for chocolate. One of those cravings that sits in the back of your consciousness all day saying, “You know you want it. Just a little. Just a bite.” If you read my last post you would know I am trying to lose about 10 lbs. As much as I would like to lose a few pounds I gotta be real. You can’t deprive yourself from sweets for weeks and expect to succeed, or at least I can’t. I have been doing great this week. Mostly feasting on recipes from Super Natural Everyday, so I decided to treat myself. Ice cream, my all time favorite. 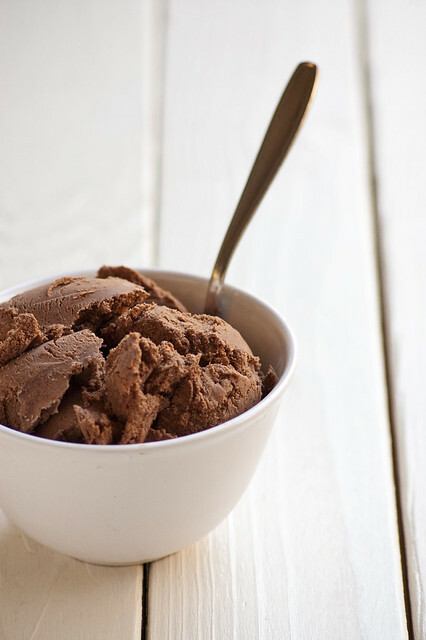 I modified David Lebovitz’s recipe for chocolate ice cream, using less cream and more whole milk as well as using chocolate chips instead of powdered chocolate. I have been testing milk & cream combos and haven’t found the perfect combination yet. Most have been too heavy on the cream which makes my ice cream taste more like frozen whipped cream. I chose to make a custard style ice cream for the extra challenge. I thought, “If I could make a good lemon curd then logically I could make custard for ice cream.” Sound thinking, right? Somehow I must have heated it too much or too long because by the time I started pouring the egg mix though the strainer and into the chocolate it was completely curdled. Bummer! I tried to strain out as much egg mixture as I could but it was no use, it looked like ricotta. Where to go from here? How can I save it. It’s almost 10pm and my chocolate craving is still roaring. I decided to strain the chocolate mixture through my mesh strainer to make sure I got all the curdled egg out. Then I added 1 1/2 cups of whole milk and 1 1/2 cups of heavy cream to the chocolate and stirred until smooth. I poured it into the ice cream maker and crossed my fingers. 5 minutes later. I am peeking in at the ice cream. Not much change. I worry that I added too much milk & cream. 10 minutes later. Its getting thicker, but I’m still worried. 17 minutes later. I have been spooning out ice cream from the opening in the top since minute 14. It’s so creamy and smooth with itty-bitty flakes of chocolate throughout. I literally cannot wait to eat it. 20 minutes and its done. I pour half into a bowl for Tom and I to share. The other half is packed into the freezer. 25 minutes. An empty chocolate stained bowl and two smeared spoons rest next to the bed. Chocolate craving sated. Nice save on the ice cream, Melissa! Nice way to satisfy a chocolate craving, too — the ice cream looks sooooo yummy. I just received Heidi’s new book last Friday and am looking forward to cooking my way through it. It’s the right cookbook at the right time for me — we just started picking greens from our garden a few days ago, and I’m ready for a summer full of healthful foods! Ohhh! Greens from the garden. I cant wait for mine! They still need a few more weeks. Now I must admit I like ice cream to, and I like cooking. This year I decided to combine the both but no matter how hard I tried I couldn’t kill the taste of custard when I made my ice cream. I’ve tried the traditional home made custard and I’ve tried ready made custard. But still there is that custard taste which says this isn’t really ice cream. It’s getting the proportions right. I am confused when you say that ice cream isn’t custard because that is exactly what ice cream is, frozen custard. There is also Philadelphia style ice cream that is made with heavy cream and no eggs (not custard). If you are not liking the custard style I would try Philadelphia style. Sicilian gelato sounds great. I am going to have to try that. Thanks!